Kibble (Lystrosaurus Egg) is a Basic Kibble in ARK: Survival Evolved. Previously, this Kibble was used to forcefully tame a Diplodocus on PC and Console; however, it is still used to tame those Creatures on ARK: Survival Evolved Mobile (excluding the Creatures that are unreleased for that platform).. Previously, this Kibble was used to passively tame a Diplodocus on PC and Console; however, it is still used to tame those Creatures on ARK: Survival Evolved Mobile (excluding the Creatures that are unreleased for that platform). 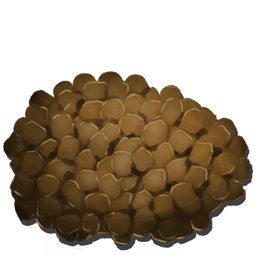 Currently, this Kibble is used to forcefully tame Dilophosaur, Dodo, Kairuku, Parasaur, and Phiomia and to passively tame Mesopithecus on PC and Console. Simply place it in its inventory when it's unconscious and it will eat one every time its hunger drops by 53.3 units. There is currently a confusion about the Berries used to make this Kibble. For some players it works with Tintoberry (see video from 13:00 to 14:00), others have to use Mejoberry. 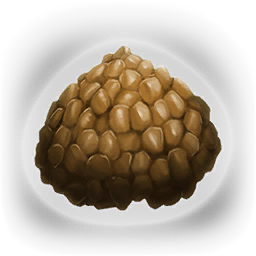 Super Kibble (Lystrosaurus Egg) is a type of Kibble exclusive to ARK: Survival Evolved Mobile. It can be crafted in a Cooking Pot or in an Industrial Cooker by substituting the normal Egg with a Super Fertilized Egg. Super Kibble (Lystrosaurus Egg) will tame a wild creature faster and with greater Taming effectiveness. This page was last edited on 10 March 2019, at 18:13.